The blast took them by surprise. It was all the more sudden since it arrived without warning of sound. But the shock wave sent Jenny spiralling down into the ship and she cursed as her automatic and her hook clattered down the ladder. Then she caught sight of the Wabbit's reflection. 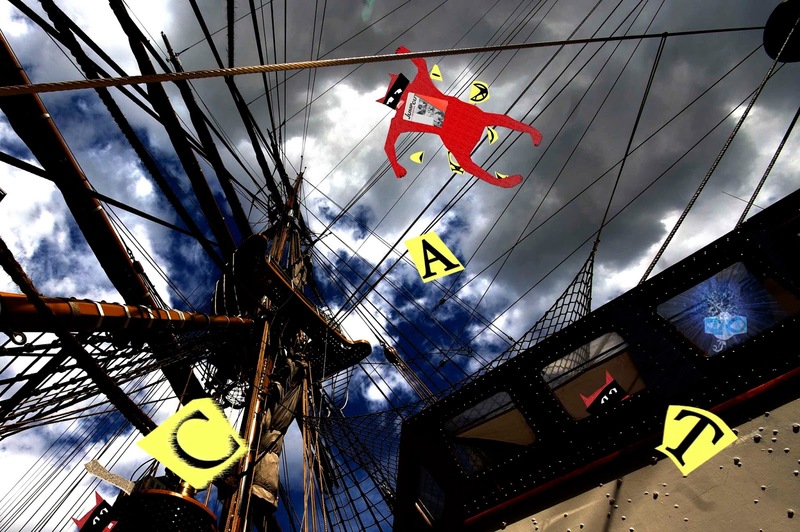 He was sailing through the air in an elegant trajectory and appeared to be coping. Jenny looked away and back. Skratch was waving and yelling something about the code but she couldn't quite make it out. Then she felt something tugging at her coat. Whatever it was, the thing grabbed her hat and threw it at the bulkhead - so she tried to bat it away. "No-one touches my hat!" she yelled. There was nothing to be seen. Just a disturbance in the air like heat on a tarmac road. But it was there all right, grasping and groping Jenny with invisible fingers. "You scurvy, jelly-boned apology for a piece of a ghost!" shouted Jenny. The spectre replied by trying to detach her boots. Jenny kicked it to no avail and looked up again. 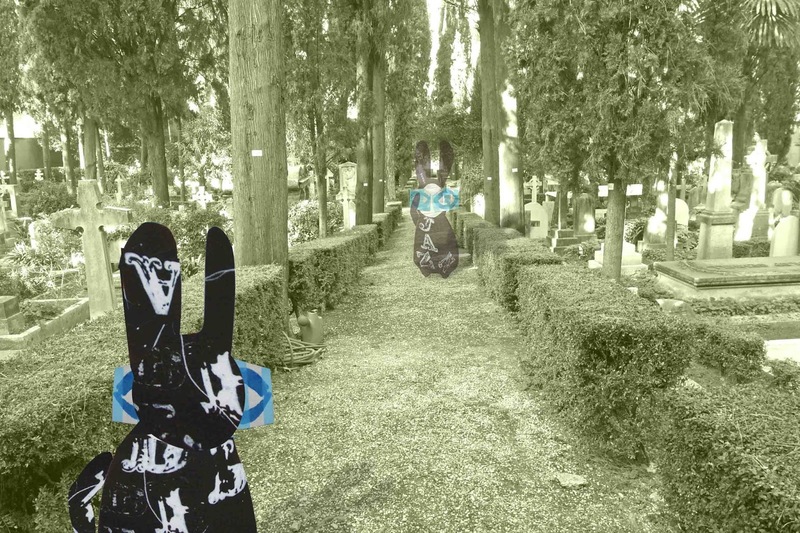 Now she saw the Wabbit waving and pointing and she realised what it was. She reached into one of the many coat pockets and touched her part of the codex with a paw. The spectral claws loosened. 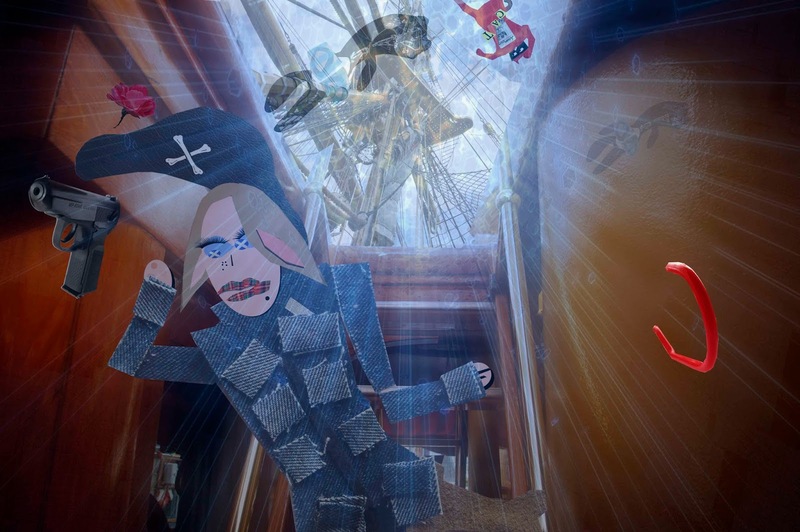 Then she heard a drawn out sound like the dying gurgle of a drowning pirate. The thing seemed to draw back and she was free to tumble. Jenny hit the deck and rolled into a corner and mumbled to herself. "I'm in one of the Wabbit's nightmares ..."
Skratch took the Wabbit aside. 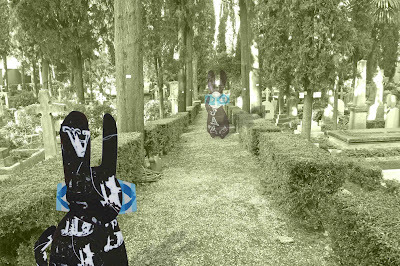 At that moment, rays of light shot through the trees to paint dappled shadows on the Wabbit's ears. Skratch handed over a single page of an old manuscript. "With your permission, I'll tell the story." 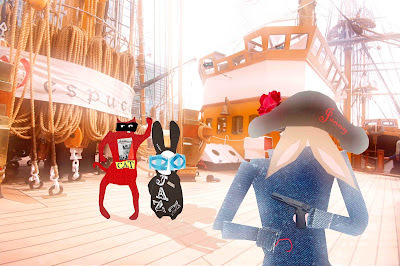 The Wabbit scrutinised the parchment and turned it over. "The occupants of the cemetery ..." Skratch had hardly begun when the Wabbit interrupted. "Spirits." Skratch nodded his heads. "These are rather famous spirits with lot of time at their disposal." He paused for effect, but the Wabbit didn't look up from the page, so he went on. 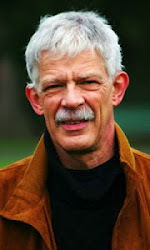 "Writers and philosophers all, they collaborated on a codex that would open the Gates of Perception. 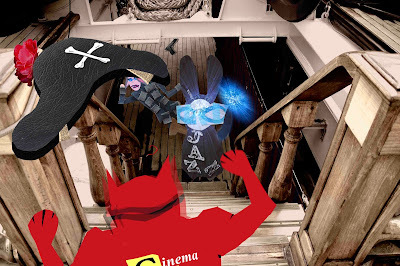 "Most unwise," muttered the Wabbit and he flipped the page over again. "Eventually," meowed Skratch. "that's what they thought too. So they removed this vital page and hid it." Only now did the Wabbit look up. "When was the codex stolen?" Skratch thought the Wabbit far too sharp for his own good and placed a cautionary paw across his shoulder. "Stolen last week." he sighed. 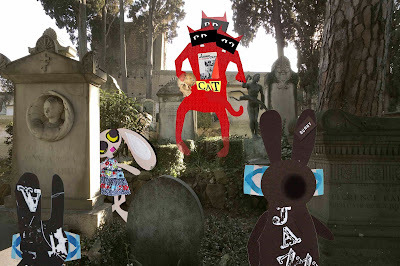 The Wabbit shrugged annoyingly. "The Codex is worthless without this page." He shrugged again. "So whoever took it will be back." "And they'll be looking for that page," said Skratch, "... which is now yours." At last the Wabbit's 28 teeth assembled into a grin. He rolled up the page and shoved it deep into his fur. "First they have to find us ..."
"Here it is!" Lapinette was delighted with her new find. 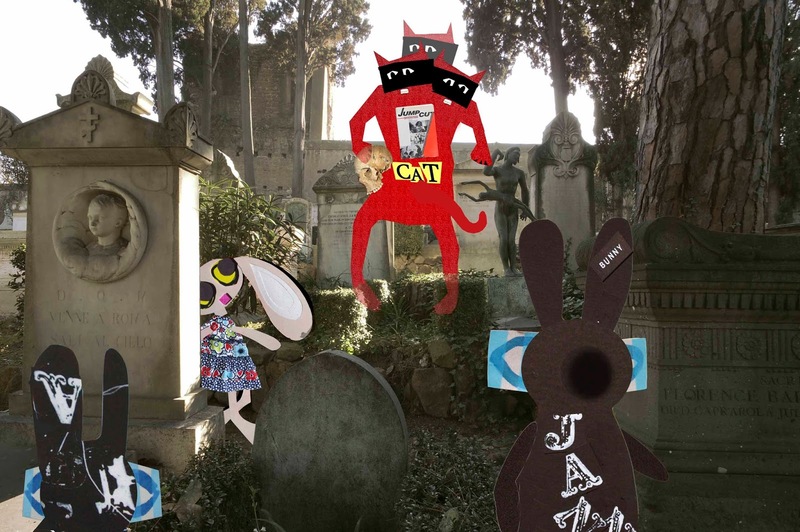 The Wabbit grinned a lopsided grin. "But there's Wabsworth in your new caffè." Lapinette sighed. "You can't keep anything a secret," A red reflection glistened momentarily in the wet street and a loud purr announced Skratch the Cat. "What a pleasant surprise!" 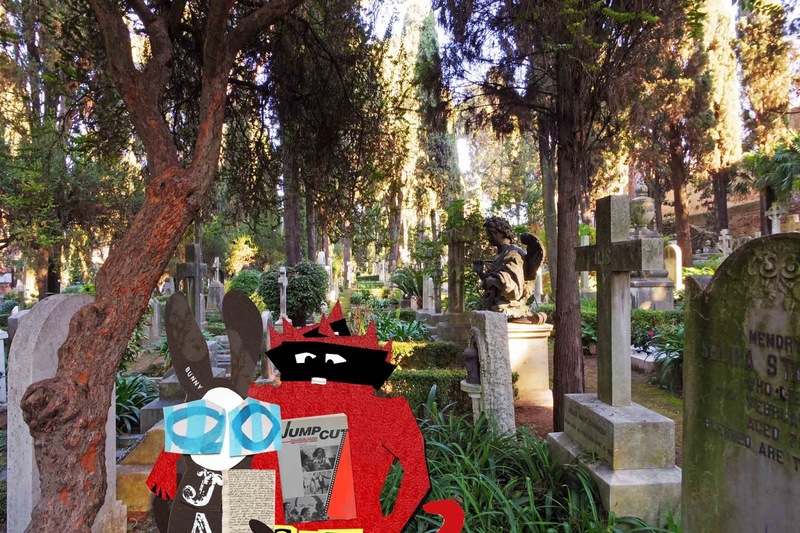 he meowed, "I was going to visit the cats of Rome. But I can do that tomorrow." The Wabbit gestured for prosecco and tramezzini all round. Wabsworth rose for Lapinette to take a seat and turned to Skratch. "What was that for a kind of adventure?" Skratch warmed his paws. "I've been thinking about it," he purred. "It was a reconstructivist post modernism, which transcended iconic representation." Lapinette hid a smirk and sat down. "Archetypal revisioning," she said firmly. 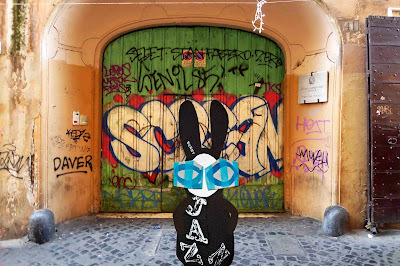 Now the Wabbit sat down and shrugged. "I thought it was about movies." 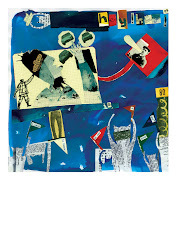 "Quite right," said Wabsworth, "a post-ecodical trauma unfolded." "With us in it," smiled Skratch. "Can you dig it?" repeated the Wabbit. "Diggin' dystopia?" laughed Lapinette. "Sounds like a possible musical," murmured Skratch and he made a note in his fur. 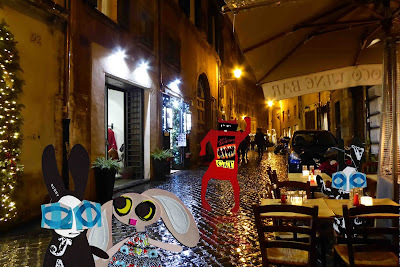 The Wabbit's tummy rumbled loudly so Lapinette handed him a sandwich. 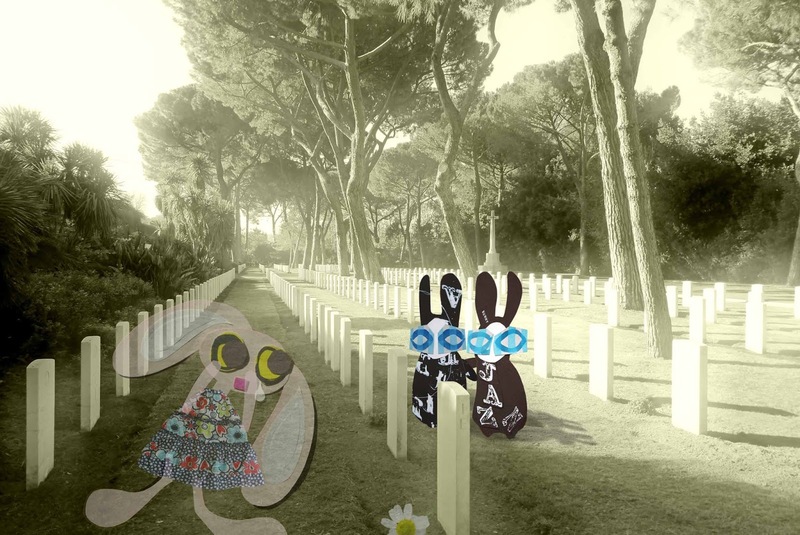 "Thanks," said the Wabbit, rubbing his stomach. "I seem to have to have a touch of dystopia." "We're back!" said Lapinette,"we're safe." She glanced at the ragged edge of her frock, then looked up. Quantum the Train flashed across the sky and was gone. Skratch laughed in a sardonic way. "We went through all that - to end up here?" Wabsworth thrust a paw into damp fur. "I like travelling." The Wabbit stood in the drizzle and let the rain wash his fur. It felt good. A normal moon peered through a normal sky. Skratch stretched tall. He shook water from his coat and thrust out his chest. Lapinette skiffed a foot through the puddles. "What about the Blood Collectors?" 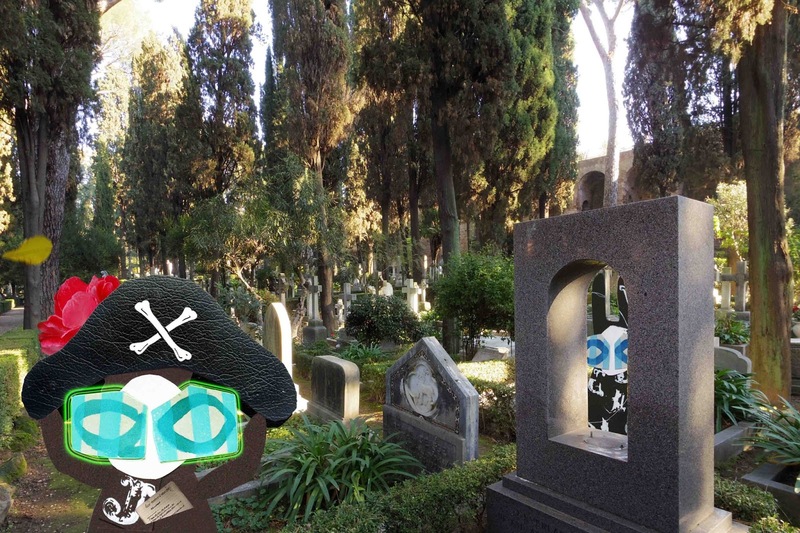 "They're real gone," said Skratch, "so adios." Wabsworth laughed. "Can you dig it?" The rain got heavier but no-one moved. They all stood still and got wet. 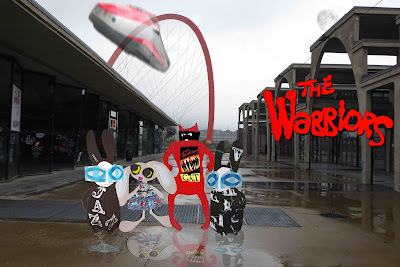 "I dig the rain," said the Wabbit. "That's our bridge," said Lapinette. Skratch boxed with his paws. "This - is our turf." Wabsworth thought for a minute and his circuits whirred. "There's always another gang, isn't there?" Lapinette looked at the Wabbit and waited. "What we have, we hold," said the Wabbit. He looked up at the normal moon and it seemed to speak. "Welcome back, Wabbit. You saved your planet." They screwed up their eyes and looked for a face in the moon, but they could only see craters. "Have a nice day," said the normal moon, Then it vanished. The rain stopped. The sky became lighter. 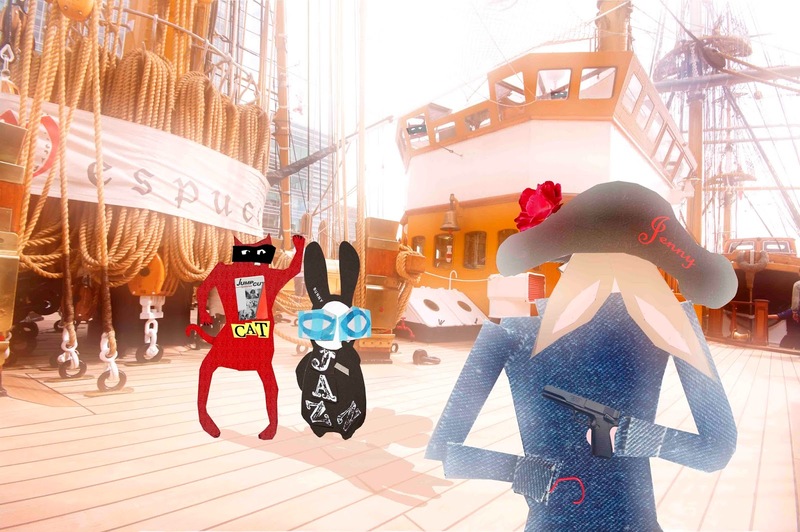 They looked at each other and suddenly a giant smile lit up the Wabbit's face. "Now let's go home," he said gently.